I’ll deal with each question in one post. First, lets refresh the concepts again. Money value of everything you produce within your country. Everything means products and services. The Money value of everything you produce within your country PLUS your income from abroad. Anil Kapoor goes to America, get 5 million dollar$ to play baddie in Mission Impossible 4, but sends that money to India = counted in India’s GNP. Similarly, Americans will subtract the dollar value of Anil Kapoor’s remittance to India while counting their GNP. So, what’ll be the (stupid) formula? Gross National production=Money value of everything produced within India+Incoming money from outside-Outgoing money to abroad. Or GNP = GDP + incoming money from abroad – Outgoing money to abroad. How GDP calculated and what is are these income, production and expenditure methods. GDP is calculated by three methods. Theoretically all three of them should give same final number, but in reality there will be slight difference between each of them. Here you count the money spent by everyone. So How to make a ‘technical’ formula? Ask yourself, where is the money changing hands? There are 5 components of that. like you and me buying (overpriced) daal, vegetables and milk (courtesy: Sharad Pawar). I buy your second-hand bike for 15,000 Rupees, should we including it in the consumer Expenditure (C) ? Nope. Because the bike Is not ‘produced again. When you had bought that bike for Rs.30000, 10 years ago, we had counted that money in that year’s GDP. So the same second hand-product sale money cannot be counted in this year’s GDP. Now, I buy your second-hand bike from an auto dealer, (who gets Rs.1,000 Commission) should we include it in the (C)? Hell Yes, because he sold his ‘service’ to me uniquely. Every time he sells a second hand product, although no new ‘product’ is created but new service is delivered by him. WHAT IF SAME 1000 RUPEE NOTE IS CHANGING HANDS? I gave a note of Rs.1,000 to that dealer as part of his brokerage (dalaali) and he gives the same Rs.1000 note to the electricity company for his monthly bill. Same Rs.1,000 note is changing hands so is our GDP =Rs.1,000 ? Nope. GDP is the money value of everything produced within India. So brokerage service is Rs.1000 separately and the electricity produced is also worth Rs.1000 separately. Therefore, even as same 1000 rupee note is given to both parties. People investing in sharemarket, putting money in banks etc. Like buying (overpriced) sports equipment from Kalmaadi’s associates during Common wealth games. Government paying salary to staff, buying new tanks and missiles..everything. Money we get from export is added. You remember that GDP means Money value of everything we produce within India. So if we import something, it has to be subtracted, because it is not produced within India. Here you count everyone’s income. But some people may be running business in credit (udhaari), sometimes payments are delayed. So may not give the ‘full picture’ for the given year. Hell no! You’ve to see the value added. So, total money value of this line is: 2000+500+1000=3500. Not all of the wheat goes into Baker’s oven. Some of it will go in making beer, some in a normal household for making roti and so on. You’ve to track the value added in each different line. To be continued… GDP at nominal price, Market price, Factor Cost, etc.etc.etc. What is the difference between GDP, GNP and PPP? Gross domestic Product is the money value of all final goods & services produced by residents & non-residents within a country's boarders in a specified time period. GDP comprises of all consumption both private and public, government expenditure, investment and net exports (exports less imports) that transpire within an economy. GDP can be valued with three methods. Value added method: This is also known as output or Production method. This method measures the value added by each producing enterprise in the domestic territory of a country. Then each producing enterprise is grouped into different sectors and finally the net value added by all sectors is added to derive the national income. For example, a timber producer may sell wood to a furniture maker worth Rs. 10,000. The furniture maker adds value by converting this wood into an office table and sells it to a furniture retailer for Rs. 20,000. The retailer sells this table to you for Rs. 25,000. If you simply add up the sales turnover of all the three businesses, you will get an inflated picture of Rs.55,000, whereas in fact, it was one table which got finally purchased for Rs. 25,000. The value added method of GDP computation therefore considers only the value added at each stage of business done, in order to compute the total GDP of the country. In this method, the figures that will be considered is Rs.10,000 for the timber seller, Rs.10,000 (20,000 - 10,000) for the furniture manufacturer and Rs.5,000 (25,000 - 20,000) for the retailer. Expenditure approach: The expenditure approach measures GDP by adding together the total expenditure incurred in buying a year's output: private and public consumption expenditures (C), investment (I), government expenditure (G), and net exports (NX). All three approaches should in theory come to the approximately the same figure. In India, the Central Statistical Organisation (http://mospi.nic.in/Mospi_New/site/home.aspx) is responsible for computing and publishing GDP data on a quarterly basis. How is GDP different from GNP? Gross National Product represents the total market value of all finished goods & services produced in a year by a country's residents - whether within the country or outside. GDP however is a measure of all economic activity that took place within the country - whether conducted by residents or non-residents. For example, the sales of Jaguars and Land Rovers from Tata Motor's UK factories to UK citizens will be consolidated into Tata Motors' consolidated accounts. But from a national income point of view, these sales will not be counted within India's GDP as it was not domestically earned, but will be considered in GNP as it was earned by an Indian entity. When considering whether GDP is growing or not, one of the biggest impediments that does not allow for an evaluation across years is inflation. If the same quantum of goods and services were produced in 2 years but the value increased in the second year due to inflation, you can't really say that there has been growth in the economy in real terms. In order to understand what the real (inflation adjusted) GDP growth really is, the nominal GDP (GDP at current prices) is deflated using a GDP deflator to arrive at the real GDP. When this real GDP is measured against the previous year's real GDP, we get a truer picture of real GDP growth. When we say GDP is growing at say 6%, what is really meant is that in real terms (net of inflation), GDP is growing at 6%. If inflation is around 8% for the year, the nominal GDP growth would actually have been around 14% (6% + 8%). This growth of 14% is however not reflective of actual growth in underlying business activity as 8% out of the 14% was due to inflation. From a corporate profitability standpoint though, the nominal GDP growth is very relevant. If the nominal GDP growth is 14%, you can say that on average the sales (topline) of companies should have on average grown by 14%. Companies whose sales value grew at less than 14% can be argued to have grown less than the national average. A topline growth of 14% should normally yield a bottom line growth of something more than 14% as fixed costs would have got spread over a larger base. However, margin pressures often cause the bottom line to grow much slower than the topline, which is what we have recently been seeing. When comparing GDP levels across countries, the standard metric is to compare per capita GDP - GDP per individual - which is a broad approximation of income per individual in each country. In order to facilitate this comparison, all GDP data in respective currencies is re-stated in a single currency - the US dollar and is divided by the population of the country. India's GDP per capita is thus pegged at $ 1,704. This means that on average, an Indian earns $ 1,704 in a year - or Rs. 93,720 (1 US$ = Rs.55). When you compare this figure with the corresponding per capita GDPs of some developed nations like USA ($ 48,112), Germany ($39,456), UK ($ 35,598) etc, you get a clear picture of the relative levels of average incomes in respective countries, which tells you how economically well-off the average citizen of each country is, in relation to other countries. There is however one criticism to this approach. If the idea is to determine economic well being, a clearly picture will emerge if you consider what amount of goods and services a certain level of income can buy in each country. After all, you earn to be able to afford to buy the goods and services you need. If your currency in the international markets depreciates due to a current account deficit or other factors, it may not necessarily mean you became correspondingly poorer in terms of your ability to buy your daily goods and services, most of which are produced locally and are thus less influenced by currency movements. This is where the concept of Purchasing Power Parity (PPP) comes in. In this approach, you first take a standard basket of a few representative goods and services that a typical individual may consume in a month (say some food items, fuel, electricity, etc). You would then add up how much this common basket would cost in different countries and uniformly express these amounts in US dollars at current exchange rates. There will be significant variations in the dollar value of the same basket spent in various countries - whereas in theory, there shouldn't ideally be. If you find for example that the common basket costs $ 100 in US and Rs. 3,500 in India, when the Indian amount is expressed in USD (at say Rs.55 to a dollar), the dollar equivalent will work out to US$ 63. In other words, you need only $ 63 to actually buy the same basket of goods and services in India, which you would buy for $ 100 in US. This also means that in PPP terms, Rs.3500 = US$ 100 or in other words the exchange rate in PPP terms should be 1 US$ = Rs. 35 instead of Rs. 55, which is where the actual exchange rate is. The Big Mac Index - published by The Economist is a simple way of arriving at PPP. By looking at the price paid in different countries for the same standard McDonald's burger, you can roughly estimate relative under/over valuations of respective currencies and arrive at a rough approximation of PPP. According to this metric, the Indian rupee is about 62% undervalued to the US dollar. In other words, if the same burger costs say US$ 3 in US, it should cost 3 x 55 = Rs. 165 in India, if the exchange rate is truly reflective of purchasing power parity. If however the burger actually costs Rs. 103 in India, then in PPP terms, Rs. 103 equates to 3 dollars and therefore the exchange rate in PPP terms should be US$ 1 = Rs. 31 and not Rs. 55. The Indian currency would thus be deemed to be undervalued by 62%. As per current official data, India's per capita GDP when expressed in nominal terms is $ 1,704, but when expressed in terms of PPP, it works out to $ 3,608. This means that while he may have earned Rs. 93,720 in a year which translated to $ 1,704, in reality his earnings would have bought him goods and services worth $ 3,608 in the US, and not just $ 1,704 worth of goods and services. Is India No 10 or No 3? In terms of nominal GDP expressed in US$, India is today the 10th largest country - which means that we are no 10 in terms of the total value of goods and services produced by each country. But, if we were to look at the PPP angle, find out the per capita GDP on PPP basis and then multiply by our population to arrive at a GDP figure on a PPP basis, India ranks no 3 in the world, after US and China. Does this mean we are the 3rd largest economy in the world or are we the 10th largest economy in the world? What the PPP basis really tells us is that if we look at just the quantum of goods and services produced, we probably rank No 3 in the world. But when we put a value to this quantum of goods and services and then express this value in dollar terms, we are the 10th largest economy in the world. If anything, this does bring out starkly the need to correct some of the fiscal imbalances in the Indian economy, which can help the Indian currency find a healthier level that more accurately reflects its internal purchasing power. What does the GDP composition tell us? Here is a table which shows the composition of India's GDP, in relation to the other countries that make up the world top 15. While we are familiar with our own GDP composition, a comparison gives some good insights. 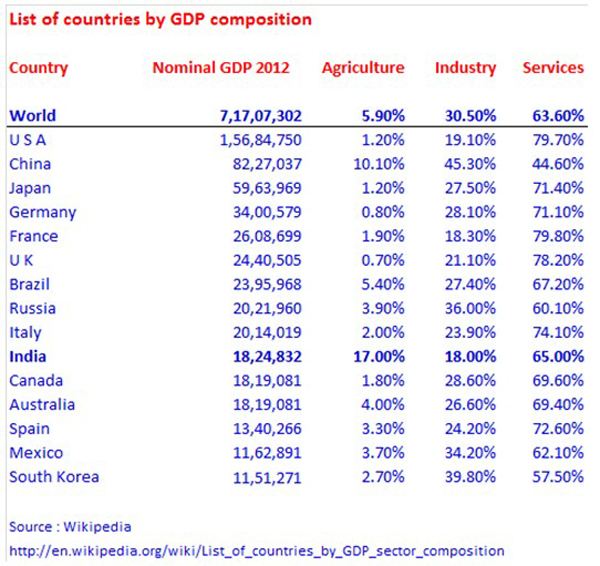 India's much vaunted services sector's contribution to GDP is really pretty much in line with world averages. What comes out as a sharp contrast to all other big countries is the very low level of contribution from industry to our GDP and the consequential higher contribution from agriculture. While much of the last decade went into lauding our service sector's contribution, it seems quite clear that for us to make meaningful and sustained progress from hereon, manufacturing will need to grow far more rapidly and incrementally attract more labour from agriculture into more lucrative jobs.